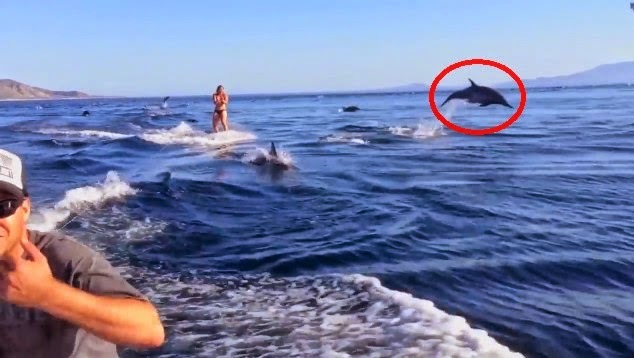 Some friends were out for a day of wakeboarding in the Sea of Cortez when they came upon a school of jumping dolphins. What happens next is pretty amazing! The sea of Cortez (also known as the Gulf of California) is a body of water that separates the Baja California Peninsula from the Mexican mainland. It is a rich ecosystem that hosts many migratory species of whales and turtles. You people need to get a freakin life. Wtf who cares it's entertaining , that's the point. I want to know what happened to the Big Foot the Rouge Team shot and killed, why haven't we heard anything about it? All the monsters are made up in the show. All the monster-bigfoot-whatever-creature hunting shows,,,, and no captures,,, that in itself is a huge fact, as far as truth of fiction, This show is more fun than a bag of monkeys, that is it's appeal, not discovering nature. Like all of these shows, not even eye witness or hidden cameras offer any decent photographic evidence,,, as the joke goes,,,-- look there is bigfoot,, quick, go get the worst camera we own--. Trail cams would offer a lot of evidence, yet not the desired evidence. The greatest not-real show ever could be The Stooges,, not real,,,,,,,,,,,,,, but what a hoot,,,, MM too,, what a hoot !!!! So fake but kinda funny. The funniest "trap" they made was a gigantic bug zapper to try and catch The Mothman. They claim to actually have caught him inside but it escaped through the top of the bug zapper because they didn't have a "lid" on it, and it jumped through it before they could get it on film. I guess they can't afford a stationary or motion sensing camera. And I love how they all have their "titles", Buck being an "Expert Caller" is hilarious. I think the only thing this idiot can call out is his order at the nearest fast food drive through. I think that "Wild Bill" seriously has some type of brain damage, and they shouldn't let him have any type of weapon. He definitely grew up in a house with lead based paint and mercury dripping all over him. And how does one get the honorary title of "Expert Tracker", because Wild Bill simply falls around all over the place, leaping around like some idiot on a five day meth bender, basically destroying any type of "evidence" of tracks that might possibly be there...but trainwrecks are definitely hard not to watch.